Finally getting over the stomach flu, I decided that eating out was necessary. Well, eating is important for a restaurant-based food blog! Luckily I keep a nice buffer of posts that come in handy when I'm ill and cannot eat! Well, that really didn't stop me from eating at Codfather's and McD's (twice!) since I figured that since it would come out anyways. I refuse to let the stomach flu rain on my parade! Today, I took full advantage of Rich Guy being around. You see, he's always game to be a dining partner. You think I eat out a lot... He never cooks. Therefore, he probably eats out more than me. 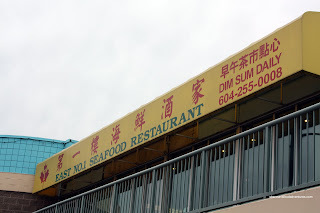 Imagine that... We ended up meeting at East #1 Seafood Restaurant for Dim Sum this morning. We really didn't want to head anywhere with a lot of traffic, so we ended up picking a place located in the ever-so-busy parking lot of T&T. Go figure. I decided to avoid the frustration and parked right on Renfrew. Believe me, once you enter that parking lot, you'll be stuck there for a while as people attempt to park in the extremely narrow spots. And when I say narrow, let's just say that it's enough for a car, but not for you to get out. The one thing you'll notice at East #1 is that they still employ the traditional Dim Sum cart. For some people, this is very important. For me, I'm a bit indifferent. Yes, it's neat to see your food before you order it; but I find that the food deteriorates as it circles the entire restaurant. And... it always seems to happen to me, the shrimp dumplings sell out at the table just before me every time. Scratch that, people run up to the cart, raid it of everything they want and then I get the scraps. Fortunately for us, we did get the Shrimp Dumplings before they sold out. Meh... They were disappointing. The dumpling skin was gummy and overcooked. Same with the shrimp. It was a bit hard and not crunchy at all. 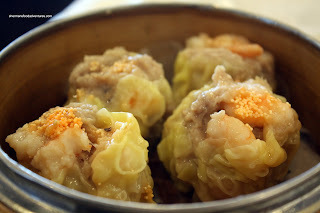 Although the Sui Mai looked good and contained a good amount of shrimp, we thought it was also overcooked. The pork was too chewy and a bit bland. The next dish was a bit surprising. Very few restaurants serve Stir Fried Silver Needle Noodles anymore. Definitely an ol' school Dim Sum dish. 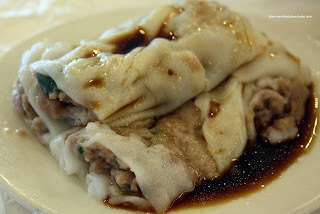 Essentially hand-rolled noodles made of rice flour, these are known for their chewiness. These ones didn't disappoint and as you can see, lots of shrimp too. 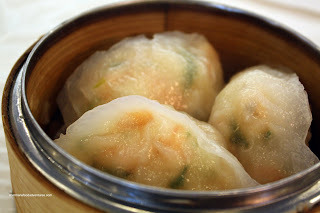 Where the shrimp dumplings failed, the Scallop and Shrimp Dumpling were better. 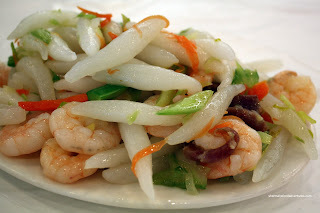 The filling was perfectly cooked with crunchy shrimp and tender scallops. However, once again, the dumpling skin was gummy. Alright, when I take pictures of soups, stews and congee, I try to take a spoonful of it to illustrate what you can't see. However, as I tried to spoon some ingredients for this picture, there was none. Actually there was, but they were in little bits. 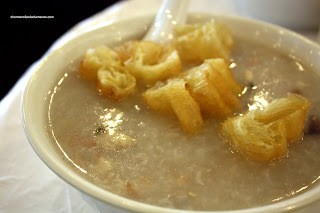 So essentially, there was really nothing in the Preserved Egg and Salted Pork Congee. To the trained eye, you will notice that the congee is prepared ol' skool or in a home-cooking way (for those who do it in that manner). What they did here was to put the egg and pork into the congee and cook the heck out of it. The result is a fairly tasty broth; but all of the ingredients have basically melted away. For me, in a restaurant, I'd like some ingredients to see and chew. 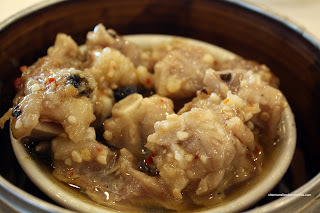 We found the Steamed Black Bean Spareribs quite oily. The meat itself wasn't too fatty; but for some reason or another, the "sauce" on the bottom of the plate was mostly oil. I know that oil is a given in this dish; but there was just too much of it. A though, we did like the garlicky flavour and the meat did have a slightly chewy texture. Looking like it just lost a bar fight, the Beef Rice Noodle Roll was aesthetically poor-looking. Either the Dim Sum chef rolling these was careless or s/he thought that a half dressed beef noodle roll would look sexier. Yah, that's a lot of meat showing, definitely centerfold material... Well, it was a whole lot better to eat than to look at. The rice noodle was soft and there was plenty of tender meat filling. I gotta say, this was one interesting session of Dim Sum. First, we had the ol' skool Dim Sum carts, that are a dying breed. Second, the Dim Sum itself was plenty ol' skool too in it's presentation, preparation and selection. Rich Guy and I were not really all that impressed with the meal as a whole. 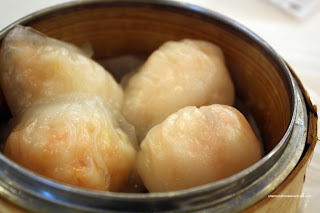 Much better Dim Sum could be had just across the street at Bing Sheng. However, I must admit that the pricing here is very reasonable and the portions are large. Judging from the clientele, I think the ol' skool theme is consistent with them as well. Very good review....Food looks fantastic!!!! Miranda, too bad it wasn't fantastic!